After graduated from both mediadesign and interactive media, I was trained to see the virtual as a place with huge advertising opportunities. Now I no longer try to see the virtual world only from this marketing perspective. Interested in innovation, the promises of new media and what they are or could mean in modern society. I would like to start off this review by mentioning that Rework is not your average new media literature. In fact, from the perspective of the authors it can be considered as business book. However, if we read between the lines, and take the background of the authors into account, we might see that this book is all about new media. 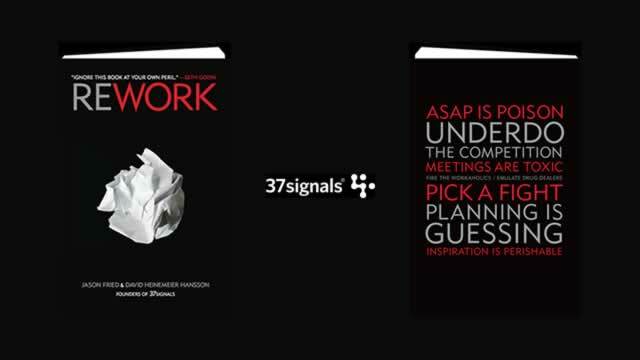 Rework is written by Jason Fried and David Heinemeier Hanson, most known to be the founders of 37signals -a web application company, famous for their collaboration tools Basecamp, Highrise, Backpack and Campfire. Aside from their products, 37signals distinguished use of alternative (freemium) business models has granted them a good amount of recognition. Jason Fried was named one of the top 35 innovators in the world according to the MIT Technology Review TR35. The authors try to shine a new light on how to build, run and grow a business. The book itself is a concise but well written book. The almost blog-like style of writing will take you through the roughly 270 pages without even noticing it. Based on hands-on experience they go against major traditional conceptions, while always maintaining focus on efficiency. As said, Rework is written to be a business book. But this terminology does not do the book justice. Probably the best way to grasp the atmosphere of this book is by the first few pages. Chapter one begins with the title: “A new reality”, following the subchapter: “Ignore the real world”. Jason Fried and David Heinemeier Hanson come from a different world then most of the authors of business books. Coming from the development of software, they grew up a world with endless possibilities. A new environment with substantial different values then the ‘real world’. Their world is the virtual world. Although the authors are not specifically mentioning the digital environment, their approach comes none the less from a view inherent to virtual world. The authors take the mentality and convert this to a new model of developing business. The different chapters in the book touch upon subjects such as making progress, being productive and the evolution of ideas. Making statements such as that making plans is harmful for your business, that you are probably better of without any meetings and that you definitely don’t need any outside investors. Share everything you know. The approach of Rework is in a way comparable to what Eric S. Raymond calls the “bazaar” model, when talking about the development of software. He states that there are two fundamentally different development styles. First, the “cathedral” model, in which software is made according to a predefined strategy. Software companies develop in solitude and release their product when it’ is ‘done’. On the other hand the ‘Bazaar’ model, which Raymond describes when talking about the development of Linux. Linus Torvalds’s style of development – release early and often, delegate everything you can, be open to the point of promiscuity – came as a surprise. No quiet, reverent cathedral-building here – rather, the Linux community seemed to resemble a great babbling bazaar of differing agendas and approaches [..] out of which a coherent and stable system could seemingly emerge only by a succession of miracles. The fact that this bazaar style seemed to work, and work well, came as a distinct shock. It is important to keep in mind that most of the ideas in Rework are essentially based on the possibilities of new media. In the new media industry it is possible to convert an idea into a working product of value in a few days. Without having to invest any money on commodities. You don’t need an office when everyone is connected to the Internet. We all know the success stories of major companies who started in a garage with nothing but computers and internet access. Taking this into consideration, Rework is not for everyone. The authors stand for a new way of thinking, a new culture. This new culture does certainly collide with established views. A friend of mine, who is a graduated economist, said after reading Rework that the book was mostly nonsense. He argued that just because it worked for them, there was no guarantee for success for another company. Companies need long-term strategies, meetings and offices. How would Philips function without any offices or employees? Confronted with reality, businesses in fact might need all these necessities. I believe this book follows the ideology of a new generation of businesses. This is exactly why this book is so useful in trying to understand the mindset of these businesses. Not just for managing a small online business. We live in a time where big industries have trouble dealing with new media. The digital and it’s inherited ideology has a profound effect on many industries, even politics. As said, the book is part of a new generation of business, The Google and Facebook generation. The authors could even be considered to be the commercial offspring of the early Internet ideologists. This book provides useful insight from another perspective. By shifting views, this can help the industry to solve the problems of new media. Stimulate a dialectic process. Where as the authors advice us to ‘Ignore the real world’, it could be seen for the real world to ‘Not ignore the virtual world’. Going by the track record of economists, that’s a hardy thumbs-up, if there ever was one. A good rule to follow: if the dismal “scientists” say nay to a book then say aye.